Researchers have shown that database triggers can interfere with the attribution process in forensic investigations. Triggers can perform actions of commission and omission under the auspices of users without them being aware of the actions. This could lead to the actions being wrongly attributed to the users during forensic investigations. 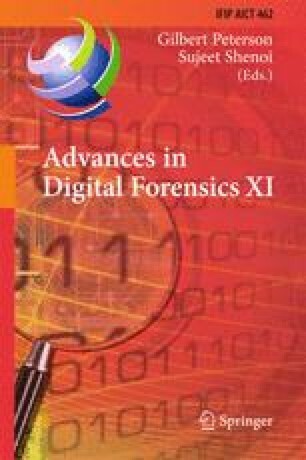 This chapter describes a technique for dealing with triggers during forensic investigations of databases. An algorithm is proposed that provides a simple test to determine if triggers played any part in the generation or manipulation of data in a specific database object. If the test result is positive, a forensic investigator must consider the actions performed by the implicated triggers. The algorithm is formulated generically to enable it to be applied to any relational SQL database that implements triggers. The algorithm provides forensic investigators with a quick and automated means for identifying the potentially relevant triggers for database objects, helping to increase the reliability of the forensic attribution process.